It's over for now, Nairobi Governor Mike Sonko has said of City Hall ban on matatus from accessing the city centre, which took effect on Monday. 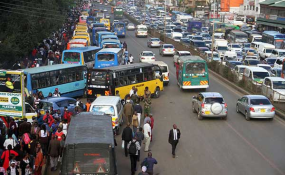 Mr Sonko on the dawn of Tuesday said he had suspended the ban "with immediate effect" to allow for talks with "all affected parties" to find a lasting solution to congestion in the city. "I have noted with concern the plight of Nairobi residents as a result of the ban and hereby announce that the full implementation of this directive has been suspended with immediate effect," he said. "This is to facilitate further consultation with all affected parties, in order to find a lasting solution to the problem of vehicular congestion". The governor, who on Monday told MPs that "there is no turning back" on the ban, appeared to regret his decision to effect the gazette notice without putting in place logistics, alternatives and the requisite amenities. "Although the directive is well intentioned, many innocent commuters, including senior citizens and those with health challenges requiring emergency medical attention, expectant mothers and children traveling with their parents, all suffered untold inconvenience, and this is regrettable," he said. "It also became clear that it is necessary to have contingent measures before enforcement of such key decisions." But while backed down, he said he was still keen to confront what he termed as the "monster of traffic jams" in Nairobi. "The time to address this monster is now. We cannot procrastinate. We cannot lose any more time. We cannot pretend to be moving forward when every day, we are stuck in traffic jams for hours," he said. "People are forced to wake up before dawn to try and 'beat' the same traffic. This is what my government seeks a solution for. We must open a new chapter for Nairobi". "I wish to reassure all commuters of the best interest of my county government to promote the best most sustainable and the best economical means of transport inside and outside Nairobi," he said. "Let us all be proactive to resolve these endemic traffic gridlocks that threaten our existence and growth as a proud, emerging city. Let us all be the solution. Both at a personal and corporate level. Not just the PSVs," he said, as he suggested some quick fixes. "Those among us who are neighbours should consider car-pooling," he said. "Let us make public transport appealing to the point where we no longer shun it in the name of class... "
"We must all pull together to dismantle the disorganised traffic attitudes and entrenched behaviours that lead to massive loss of man-hours and burned fuel in traffic jams."